This quote is special to me for several reasons. First, when my children were little, I bought a copy of Oh, the Places You'll Go! for each of them. At the end of the school year, I asked their teachers to write a short note and sign inside the book. Keeping the book a surprise was no easy feat, but I was able to get each of their teachers from kindergarten through high school to add their thoughts. I then gave the books to them on their graduation day. Now, truth be told, our youngest was not surprised because she watched her older brother and sister receive the same gift. In fact, she couldn't wait to get hers. It's something special that all three of them (yes, even my son), treasure. I've always been someone who likes to learn new things, but this year, I took a huge leap. I began a doctoral program, which has been a dream of mine since I was an undergraduate. To be honest, sometimes I wonder what the heck I'm doing taking on this endeavor on at my age, especially when I'm in class with a bunch of 25 year-olds who are the same age as my daughter. Nevertheless, I have been reading and reading and reading some more and learning so much. Sometimes it feels like my brain is going to explode. It's exhausting and exhilarating at the same time and I'm so very glad that I'm doing it. So, this morning, I thought I had my post planned out based on the two points above. It's all very bookish and academic...pretty traditional kinds of learning. But we all know that learning goes beyond books. And this afternoon was the perfect example. I decided to finally make the stir fry I had been planning for two weeks. (Remember yesterday's post about how easy it is to go out to dinner?) I wasn't sure if the vegetables would still be fit for consumption. A few of the veggies had passed into the slimy, squishy stage, so they went directly into the garbage. Some of them were still identifiable, albiet a few scars and yellowing flowerets that needed peeled away. I chopped, marinated, and whisked away, pretty darn proud of myself that I was getting dinner put together for the two of us. It used to be that making a hot, balanced meal for my family was something I never skimped on. However, cooking has become a bit more infrequent lately. 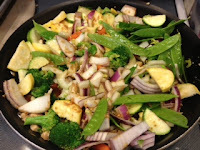 I heated the frying pan, fried the tofu that had been marinating and then added all of the veggies I had chopped. I stepped back and laughed out loud. The frying pan was filled to the brim, and I still needed to add rice noodles. I realized then and there that I am still learning how to cook for 2 people instead of 5. I'm not sure it's a lesson I'll ever learn very well. 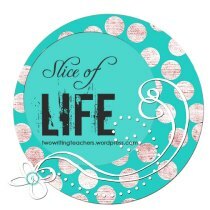 To read more Slice of Life stories, visit Ruth and Stacey at Two Writing Teachers. I love the book idea. I can't dream of being that organized. I wish I had thought of the book idea. Hmmm...she just started high school this year. Maybe I can get it together for these four years. As a freshman, she's already dreading friends going in different directions. Learning to cook for 2 was hard for me too. But I had to learn when we first married because I learned to cook while growing up for my family of 7. We had lots of leftovers in the beginning. Congratulations on going for the doctorate. I did that late in my career too. Just like you, it was something I had always wanted. I found the concentration difficult, like I had cobwebs in my brain. i finally completed the dissertation & graduated in 09, grinning like an opossum. Congratulations on following your dream. It sounds like you are accomplishing many new things. 1. What a cool thing to do for your kids! Those books are priceless. 2. Congratulations on following your dream. Best of luck in all the classes. 3. Cooking for two is tough, but the bonus is I only have to cook two to three main dishes a week. Having your children's teachers sign Oh the Places You Go was genius! My children are grown, but hopefully there will be grandchildren someday :-) As far as cooking for two is concerned, I don't even try. I love having leftovers! Also - L.O.V.E. your book gifts to your kids. Brilliant! This says it all, Julie: "It's exhausting and exhilarating at the same time and I'm so very glad that I'm doing it." I'm so very glad you're doing it. I'm looking forward to following your journey. As for the 25 year olds, remember experience brings its own advantages.